Sure, it’s been hot in Toronto. But Alexi Murdoch was hotter. Waaay hotter. 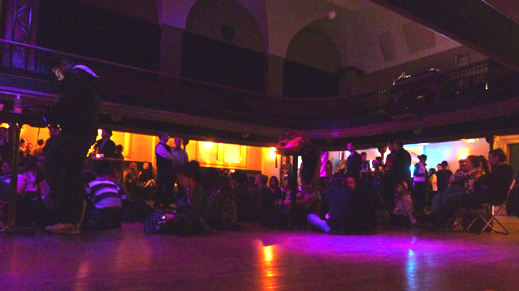 Last Saturday at The Great Hall. And it’s not because there was no air con. OK, part if it was the stifling heat and lack of air circulation in the packed venue. I won’t lie. I showed up at 10:50 p.m., two songs into the British singer-songwriter’s set, and a few songs later people were already starting to sneak out to get some air. Now, I can understand people leaving because of the heat. I’d been hemming and hawing about cooling down with a swim, catching a breezy outdoor concert at Harbourfront or the Toronto Jazz Festival, or paying the $18 to cram into sweltering Great Hall to see Alexi live. But am I ever glad I chose to pony up the bucks and brave the overheated hall, because Alexi was utterly captivating – with just him and his guitar. 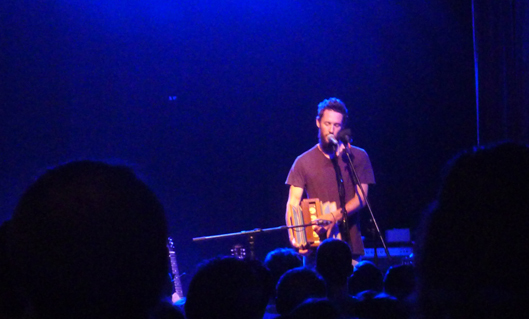 Well, his guitar, his violin (which he played like a guitar), and this odd, accordion-like instrument (shown below). Alexi’s songs are hauntingly beautiful, and not nearly as depressing as William Fitzsimmons’ (which I like, too, but, man, is his stuff ever dreary). 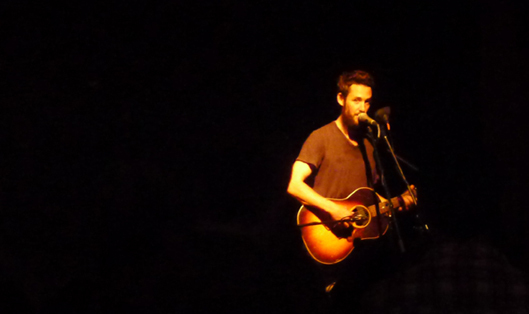 He was a little low on the banter, which I always worry about, since much of what I enjoy about concerts is the performer’s engagement with the audience. Alexi, however, mostly focused on the music, save for a request to turn the stage lights off and a ceiling fan on, and a comment about taking a risk before tackling the instrument shown in the photo above. Oh! There was also mention of his enjoying silence – and that we all should experience silence, even for just a few minutes a year. That might explain why he was so quiet between songs. 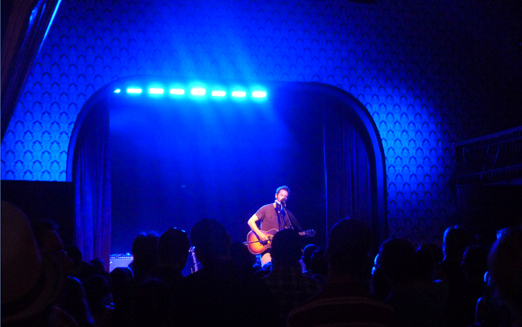 As someone remarked after the show, Alexi would suit a much smaller venue better. I’d secretly been hoping only a hundred of us would turn out, as I’d wanted a repeat of my Yael Naïm experience, with the small lot of us sitting on the floor, completely enthralled by the singer (see below). Instead, it was standing room only, which really shouldn’t have surprised me. Even if you’re not familiar with his latest release, Towards the Sun (2011), you’ve no doubt heard Alexi whether you know it or not: tracks from his debut LP, Time Without Consequences (2006), peppered the Away We Go soundtrack and appeared in The O.C., Grey’s Anatomy, Brothers & Sisters, Dawson’s Creek, House, Ugly Betty…you name it. And even though I ran out of water and was near fainting, I count myself lucky to have caught Alexi live last weekend. 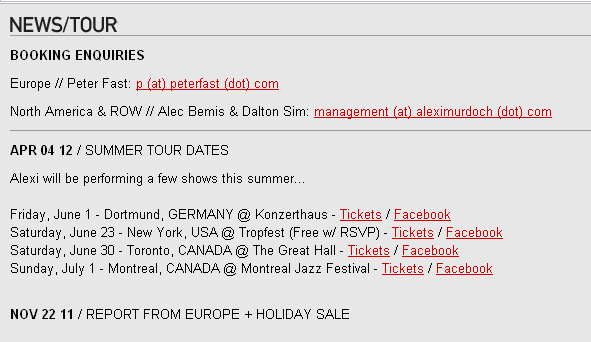 For some reason, his summer tour is sparse, with just four dates, three of which occured last week. But thanks to the mysterious Jakery, who posted this vid of Alexi at The Great Hall, you can catch him “live in Toronto” too!